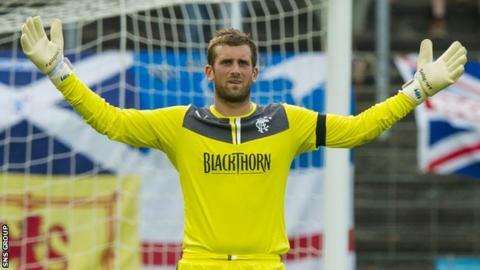 Goalkeeper Cammy Bell is the latest injury concern for Rangers ahead of Saturday's Scottish Cup semi-final. Full-back Lee Wallace, forward Andy Little and winger David Templeton are all fitness doubts for the tie against Dundee United at Ibrox. And reserve keeper Steve Simonsen has suggested that Bell will miss out. On Thursday evening, Simonsen tweeted: "Feel so sorry for Cammy, it's rotten luck, but I will step up; I want this so much..."
The former Everton, Stoke, Sheffield United and Dundee player has made one appearance for the League One champions, keeping a clean sheet in a league win at Forfar in January. The 35-year-old later added: "I hasten to add i'm (sic) not saying Cammy is 100% out of the game. Just that I'm fired right up if it's the case! This is why I'm here, to step up." Earlier this week, manager Ally McCoist expressed doubts over the fitness of Wallace, Little and Templeton. "Lee has a hip flexor problem at the top of his thigh and he's struggling a little bit," said McCoist. "I wouldn't think Andy and David will make it though." Wallace had to be substituted midway through the second half of Sunday's Ramsdens Cup final defeat by Raith Rovers. "We'll give him every chance, but I'd have to say there will have to be a dramatic improvement for him to be involved at the weekend," McCoist told Rangers' website. Little and Templeton have been out of action since picking up injuries against Airdrieonians on 12 March. "From speaking to our physio, Stevie Walker, there would have to be an unbelievable improvement in them," said McCoist. "We've been a little bit unlucky with injuries at a really important time of the season, but we have to prepare the team as best we can." Strikers Jon Daly and Nicky Clark, plus midfielder Nicky Law, came through the Easter Road final unscathed despite being pre-match injury doubts.